Andrew Meyers, a former convict, started Sooner Than Later as a way to keep at-risk children from following his path to prison. It also provides a measure of redemption for Meyers as a father after his son was shot to death in 2015. KANSAS CITY, Mo. — Andrew Meyers knows his way around a kitchen. That was pretty clear as he showed a teenager how to chop onions earlier this month inside a community kitchen off Wornall Road. "Tuck your hand in," Meyers instructed. "Put it steady." This is Meyers' way of paying it forward. "A lot of good chefs took me under their wing," he said. Now, Meyers has started a group called Sooner Than Later, which is aimed at intervening in young people's lives before violence and crime takes hold. The group hosted a Memorial Day service last spring for young people killed by gun violence. 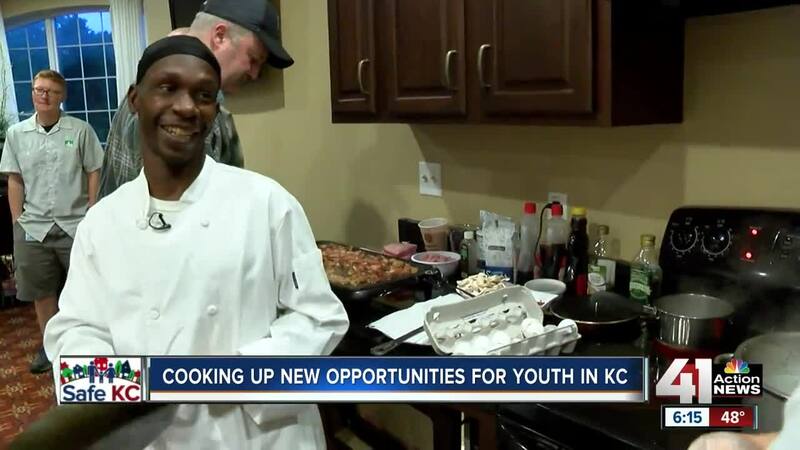 The latest project hosts cooking classes for youth at Cornerstones of Care, a Kansas City nonprofit. "These young men and women come from a lot of different places, a lot of communities that are unfortunately broke, a lot of families that are really struggling," Cornerstones of Care's Healthy Living Manager Theo Bunch said. Some of the kids involved in the new project, whose identities are being withheld for privacy reasons, are in foster care. Others are simply growing up in poverty. That's a big reason Meyers wanted to start at Cornerstones of Care. "The things they're going through I can actually compare to," he said. After a stint in prison, cooking became a way out for Meyers — whose son, Andrew Meyers Jr., also was incarcerated before he was shot to death in 2015. "I take them as my son, you know what I'm saying?" Meyers said through tears about the children in the program. "To be able to do for them what I couldn't do for him." The staff at Cornerstones of Care said the time spent in the kitchen is more valuable than just creating delicious food. "This is preventative action," Bunch said. "This is us building a community and investing in these youth and, so, hopefully the bad thing doesn't happen." Meyers appreciates the chance to honor his son's memory and help young men at Cornerstones of Care find a better path, like the one who recently wrote him a letter about the cooking class. "I feel love, I feel connected when I am with you," Meyers said, reading from the letter. "I feel like I have a father and a true friend." As Meyers wiped a tear from his eye, he said he planned to frame the letter and hang it at his residence. Anyone interested in volunteering with Sooner Than Later, should contact the group's Facebook page .